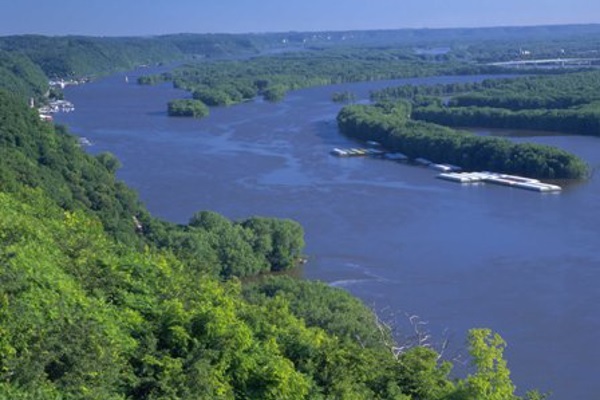 Targeted conservation work in the Mississippi River basin will unite the USDA, farmers and local organizations to help clean waterways that flow into the nation’s largest river. USDA’s Natural Resources Conservation Service (NRCS) is investing $10 million this year in 27 new high-priority watersheds and 13 existing projects that will help improve water quality and strengthen agricultural operations. This investment is part of a commitment of $100 million over four years to address critical water quality concerns in priority watersheds while boosting rural economies. NRCS worked with state agencies, farmers and other partners to identify high-priority watersheds that align with established state priorities and have strong partnerships in place — and where targeted conservation on agricultural land can make the most gains in improving local and regional water quality. Conservation systems implemented in these areas will reduce the amount of nutrients flowing from agricultural land into waterways, curb erosion and improve the resiliency of working lands in the face of droughts and floods. This investment builds on $18.5 million already allocated to projects in the basin in fiscal 2015. These projects are funded through the agency’s Mississippi River Basin Healthy Watersheds Initiative (MRBI), which uses funding from several Farm Bill conservation programs, including the Environmental Quality Incentives Program (EQIP), to help farmers adopt conservation systems to improve water quality and habitat and restore wetlands. Since MRBI’s start in 2009, NRCS has worked with more than 600 partners and 5,000 private landowners to improve more than 1 million acres in the region. Through these partnerships, the initiative more than quadrupled the number of contracts addressing water quality concerns in targeted project areas. Lower South Fork Root River Watershed, Minnesota: NRCS will work with the Root River and Fillmore soil and water conservation districts, Minnesota Department of Agriculture, The Nature Conservancy, Minnesota Agricultural Water Resource Center, Monsanto and others to achieve a 40 percent reduction in sediment and associated phosphorus by 2020. NRCS plans to invest $39,000 in fiscal 2015 as part of a $1.2 million commitment in the watershed over four years. Headwaters-Big Pine Creek, Indiana: NRCS will work with the Benton and White county soil and water conservation districts, Big Pine Creek Watershed Group, The Nature Conservancy, Conservation Technology Information Center, Ceres Solutions LLC, Purdue Cooperative Extension Service, Indiana Soybean Alliance, Pheasants Forever and Indiana Department of Environmental Management to reduce nitrogen, phosphorus, and sediment in this critical watershed to improve the conditions of waterways for recreational use and wildlife. NRCS plans to invest $50,000 in fiscal 2015 as part of a nearly $500,000 commitment over four years. Long Lake, Mississippi: NRCS will work with Delta F.A.R.M., Mississippi Soil and Water Conservation Commission and Mississippi Department of Environmental Quality to address water quality concerns in priority watersheds identified in the Delta Nutrient Reduction Strategy. NRCS plans to invest $710,000 in fiscal 2015 as a part of a total commitment of $4.3 million over four years. See full list of watershed projects. Projects will be funded in Arkansas, Illinois, Indiana, Iowa, Kentucky, Louisiana, Minnesota, Mississippi, Missouri, Ohio, South Dakota, Tennessee and Wisconsin. Conservation systems include practices that promote soil health, reduce erosion and lessen nutrient runoff, such as cover crops, reduced tillage and nutrient management; waste management systems that treat agricultural waste and livestock manure; irrigation systems that capture and recycle nutrients back to the field; and wetland restoration that increases wildlife habitat, mitigates flooding, and improves water quality. Findings from a 2014 report by the USDA’s Conservation Effects Assessment Project (CEAP) show that conservation work on cropland in the Mississippi River basin has reduced the amount of nitrogen and phosphorus flowing to the Gulf of Mexico by 18 and 20 percent, respectively. CEAP models have also shown that the targeted approach of MRBI has enhanced the per-acre conservation benefit by 70 percent for sediment losses, 30 percent by nitrogen losses, and 40 percent for phosphorus losses, when compared to general program activities. Meanwhile, watersheds prioritized by MRBI have shown clear successes in helping to improve water quality. For example, two stream segments in the St. Francis River watershed in Arkansas have been removed from the U.S. Environmental Protection Agency’s list of impaired streams. MRBI is one of many landscape-level efforts to address water quality; similar efforts are ongoing in the Great Lakes region,Gulf of Mexico region, Chesapeake Bay watershed and California Bay Delta region.